We had a great first meeting at our new location on Wednesday! It's a much larger space and should work out great for us. 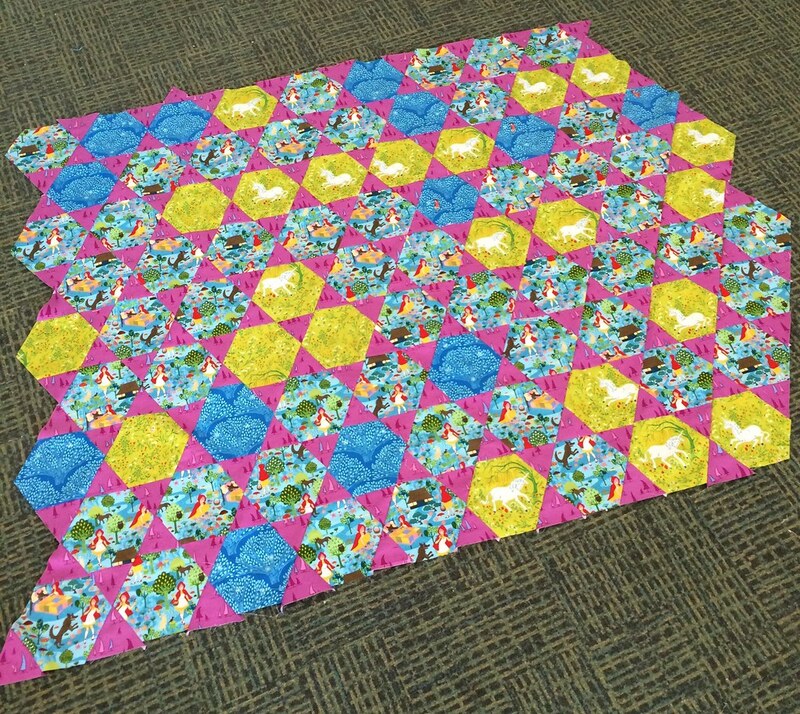 QuiltCon will now occur annually--Pasadena in 2016 and Savannah, GA in 2017. Rooms are already open for reservations in Pasadena. 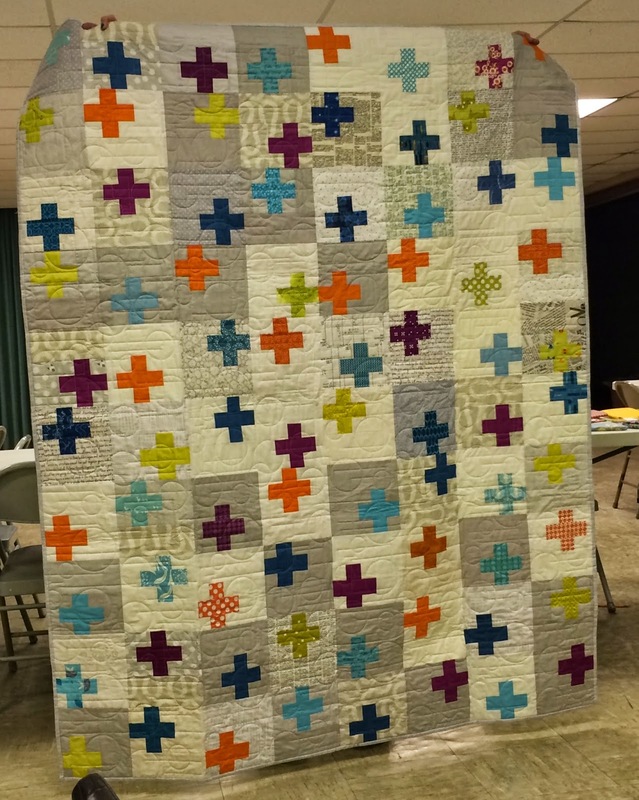 If the quilt hung at QuiltCon (or if it has been displayed anywhere within 200 miles of La Grange, TX), it is not eligible. Must have been made after 2005. This is a juried contest with cash prizes. Some quilts chosen will become part of a traveling exhibit. Submissions due December 1st, 2015. Fabric won't be in until March, so we discussed pushing back the deadline for the swap. 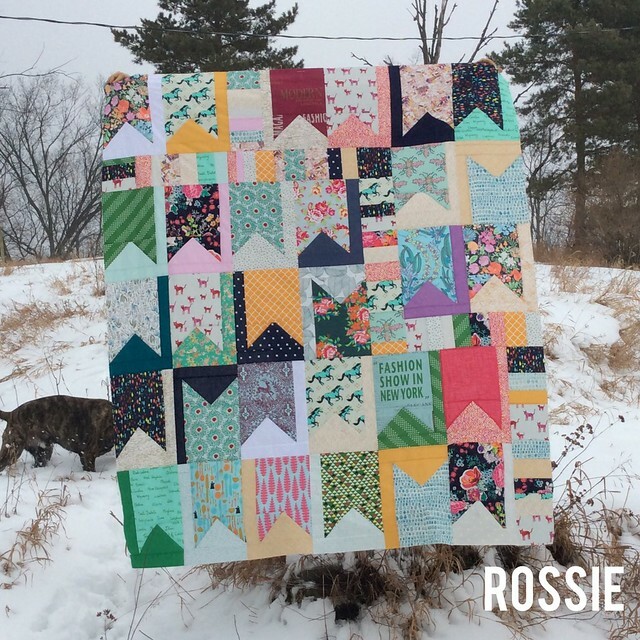 If you want to make samples for quilt market, they will need to be done by the April meeting--otherwise, we discussed the challenge being open until May or June. We can finalize this at the next meeting. We will be doing a block lottery. We all make the same block and for every block you make you get one entry into the lottery. The lottery winner takes home all blocks. There is no pre-sign up, just bring the blocks to guild. We will be doing the Scrappy Trip Around the World block in bright juicy colors. The tutorial for the block is here. The finished block size is 12 inches, which means the size of the block brought to guild is 12.5 inches. Here's a flickr group for inspiration. Jen put this together to show where our money went last year, and it can be viewed here. Thanks, Jen! Kathy Koch was kind enough to bring a small sampling of the books available in our guild library. If you're looking for a book, feel free to contact Kathy before searching elsewhere. She can bring it to the next meeting. She's working on putting together a database with all the titles. While we have many books, Kathy noticed we are lacking books about modern quilting. If you have one you'd like to donate, contact her or bring it to the next meeting. If you weren't able to see her quilts in person, here are a few pictures (taken with a cell phone--I'm no photographer, but these were some lovely quilts!). Rebekah's favorite quilt she's made--from scraps of other projects. Brenda showed us how to do a ladder stitch binding. I found a tutorial similar to the one she demonstrated on the Sometimes Crafter blog. 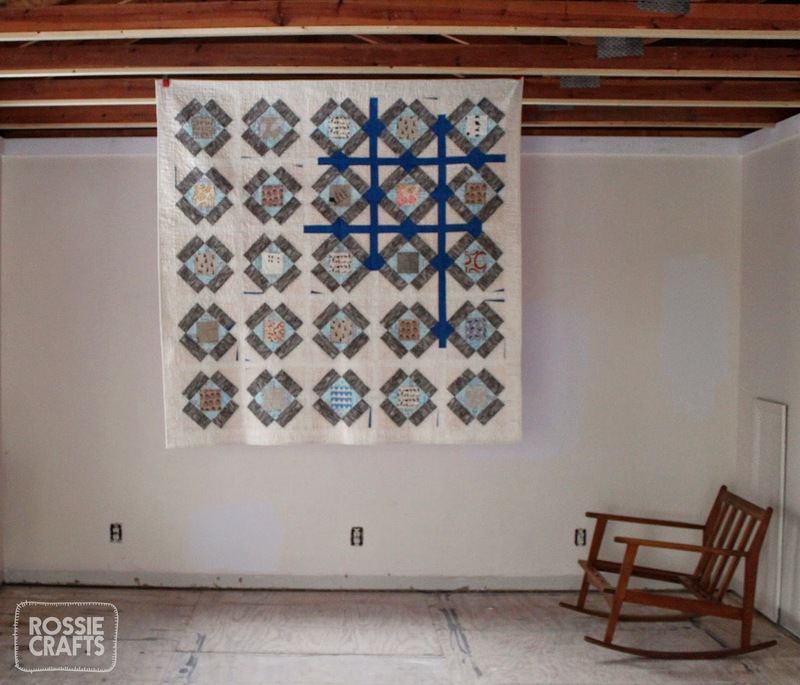 This is a great way to bind quilts, since the thread isn't seen at all. We had some lovely additions to the round robin quilts this month! If you'd like to join or jump back in, contact Dorie. Our quilts came home with us, now we need to decide what to do with them! 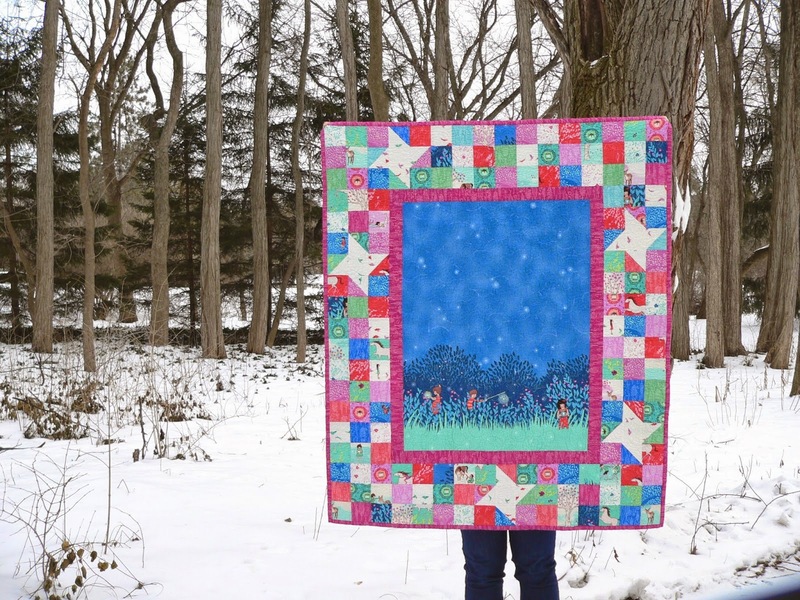 Some suggestions were to donate them to Habitat for Humanity, Alpha House, Ypsilanti Youth Orchestra, or we could sell the quilts through eBay and donate the proceeds to a charity of our choosing. We had a fat quarter swap this meeting. Debbie Grifka did a wonderful skill school last month on Instagram. Because it can be difficult to find all of our guild members on social media and stay connected to the guild blog and other updates, I thought it would be a good idea to create an account for the guild. You can find us at @A2MQG -- if you comment on the post with your name, it makes it easier for other people to know who you are (some of our usernames are blog/company names, which can get confusing). Use the #a2mqg tag on things you'd like to share with other members--I'll be periodically reposting things relevant to our guild! 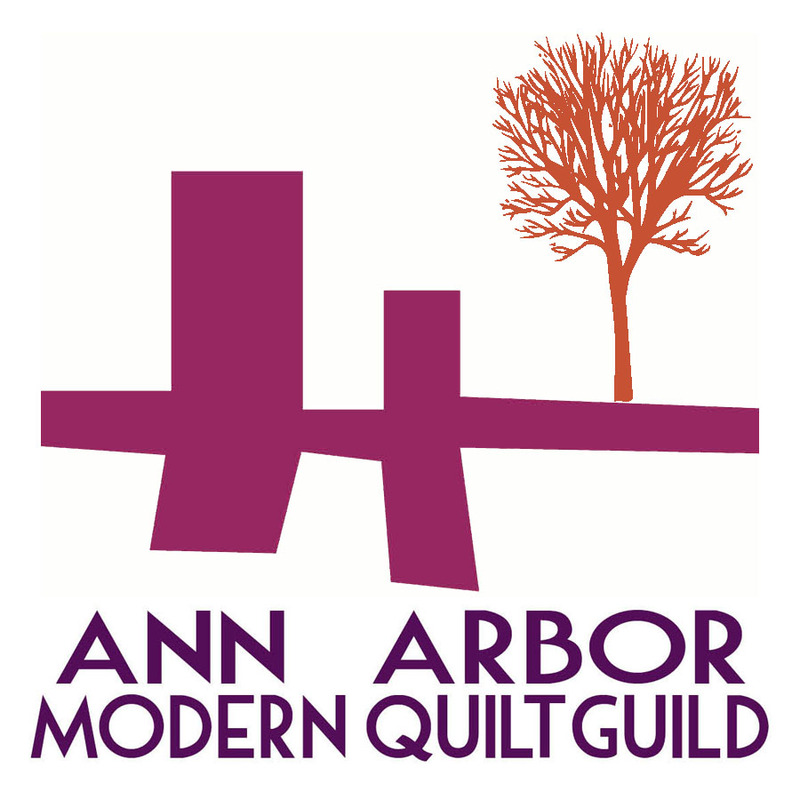 If you'd like to follow other guild members, simply click on the first post (everyone has commented with their names) or see who the account is following--I am only following back members of the Ann Arbor Modern Quilt Guild. Our next sew-in will be March 19th from 5-9 pm at Pink Castle Fabrics and our next meeting will be March 25th at Calvary Methodist Church in Ann Arbor. Hope to see you there!! Meeting this Wednesday at Calvary Methodist! Our next meeting on Wednesday, February 25th will NOT be at Pink Castle Fabrics. Instead, we will be meeting at Emily's church, Calvary Methodist. It is located at 1415 Miller Ave, at the corner of Miller Ave. and Newport Pl. on Ann Arbor's west side. For more information about the location, their website is here. Don't forget to bring two fat quarters if you'd like to participate in the swap! Random FQ Swap: Bring in 2 fat quarters, go home with two different fat quarters. We will draw numbers and select one fat quarter in order, then we will select a second fat quarter in reverse number order. Make sure the FQs are quilt shop quality modern fabric. Do not wrap the fat quarters. Meeting starts at 6:30pm. Can't wait to see you there. Our next meeting will be held February 25th at Calvary United Methodist (Emily’s Church). If you’d like to participate in the fat quarter swap, bring two fat quarters to the meeting. Third Thursday Sewing Night will be at Pink Castle Fabrics on February 19th at 5pm. Register on the PCF website. Space for ten people. o MQG announced that QC will happen every year and will move each year. § The idea of possibly renting a house/condo in Savannah, GA in 2017 with other A2MQG members was mentioned. o We will (hopefully!) have the fabric at the February meeting. o All the spots filled up in an hour. If you’re still interested in participating, you are allowed to purchase the fabric. See the MQG site for details. o If you aren’t getting MQG emails, talk to Brenda or Rossie. o We came up with lots of ideas for swaps to do in 2015. Our definite swaps so far are a fat quarter swap in February, the Pie Making Day challenge quilts in April, and a Secret Stalker Swap (just like last year!). o If you are unable to attend a guild meeting and you are involved in the round robin, there is now a blue bin at Pink Castle Fabrics. Ask one of the employees and they’ll lead you to it. o Debbie Grifka asked for some more ideas for skill school. We should have a lot of really great skill school sessions this year! o We discussed using either a closed group on Facebook or the MQG Ann Arbor page in order to more efficiently communicate with other members. · Debbie Grifka gave a wonderful and informative introductory lesson to using Instagram. Our guild hashtags are #a2mqg and during retreats, #a2mqgretreat. · Ginia won the Crayon Challenge! · The election was followed by a very informative reading of the bylaws (which can be found on the top of the blog!). Consider refreshing your memory by rereading them this year! 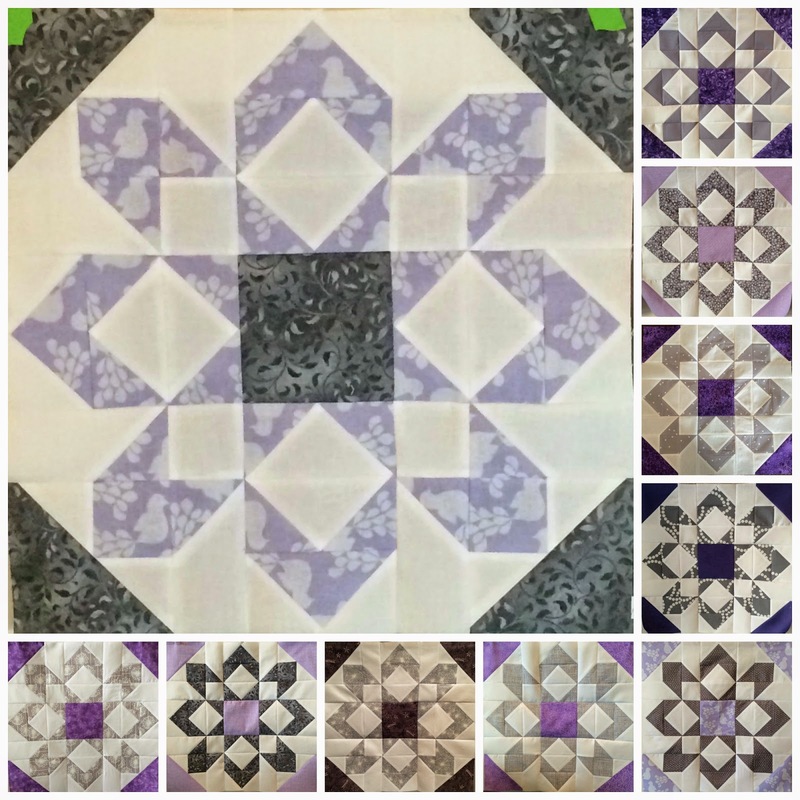 · We saw some great progress on the round robin quilts and awesome finishes at Show and Share!